Are you remodeling your house and looking for new hardwood flooring types? Are you on a small budget and searching for the cheapest price in town? Our flooring company has everything that you need to finish your home improvement renovation quickly and stay within your budget. Whether your home is modern and bright or composed of earthy neutrals for a conservative look, we have floors that complement every style. Choose from our large selection of solid, engineered, or reclaimed hardwood floor materials to create any kind of theme, from chic minimalism to rich luxury. No matter what kind of hardwood floors you want, you can rely on finding them for a budget-friendly price at our shop! For a durable surface that is just as charming as our solid hardwood option, consider our engineered hardwood floor. 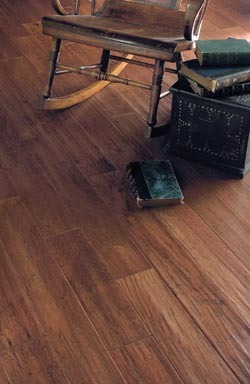 This flooring material consists of multiple layers of wood, which gives it a dense and stable core. There are many factors that come into play when choosing the ideal hardwood flooring for your home. One of these factors includes the location of your home. If your home is below ground level, it would be best to select the engineered hardwood floor option because it is designed to withstand moisture. Meanwhile, solid flooring provides the charm and elegance of authentic wood materials. Turn your house into a cozy and rustic home with our beautiful reclaimed hardwood material. This surface covering is made from previously-used wood materials. If you desire to give your property that distressed look, reclaimed hardwood is an excellent flooring option. It’s never been easier to install the floor of your dreams. When you order hardwood floor materials from our company, we will gladly come to your location and put in the flooring for you. Your floors are an important part of your property, so it is a good idea to have them installed by professionals. During our hardwood floor installation, we carefully measure the layout of your individual home and determine how much material is needed to cover the area. No two properties are alike, so we make sure to provide installation services that are customized to each individual customer’s needs. If you have a question about our hardwood floor installation services or want to learn more about our latest promotions, feel free to speak with one of our experienced sales specialists. Contact us to explore your floor covering options by browsing our selection of elegant hardwood flooring. We proudly serve the communities of Bethlehem, Allentown, Easton, Hellertown, and Palmer, Pennsylvania.